Stop the Worm Cult from resurrecting an Ayleid king. Rulanyil's Fall — Explore the ruins of Rulanyil's Fall. "Freedom at last! Where in Oblivion am I?" The Worm Cult has invaded the ruins of Rulanyil's Fall, intent on raising an Ayleid warlord from the dead. Endarwe wants to ensure the body is not disturbed. Speak to Endarwe inside the ruins of Rulanyil's Fall. Find and examine the ancient warlord's body. Follow the ghost and speak to it. This quest can be begin by entering the Rulanyil's Fall public dungeon in Greenshade. Right inside the entrance, you can find Endarwe, who will give you this quest. "Welcome to Endarwe's Muesum of Wonder and Antiquities. Normally, I'd tell you to avoid touching anything, lest you defile my sanctum, but the necromancers that came in before you have already ruined everything." Ask him what he's talking about, and he replies: "They are a dreadful people. From the Worm Cult, I believe. They destroyed countless priceless artifacts, ruined decor, killed my employees. Then they turned my employees into their employees by raising them as undead!" Ask him if he knows their purpose, and he says: "I suspect they want to raise the centerpiece of my collection, the Aleyid Warlord Ceyran! People come here just to see him. 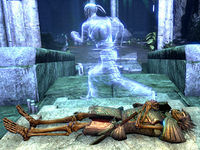 Ceyran worshipped Daedra, and was generally an unpleasant fellow. Excellent as a museum attraction, terrifying as an undead." Tell him that you'll check the warlord's remains, and then begin exploring the dungeon. There are many enemies in the dungeon, since it is a public dungeon, so you may want to stick with someone else if you are a low level. The Aleyid king is located at the southernmost point of the cave. Head south from the entrance and turn either left or right; either way, you end up at the king's location. The fastest way to go is left, so this walkthrough will describe that route. Turn left and go down the stairs, and through the passage into the large, waterlogged room. Fight your way through this room and exit through the south passageway. At the end of the hallway, turn right, and emerge on top of the large elevated hallway surrounding the southernmost chamber. Head around to your right until you find the central stairway, and go down these stairs. Once on the lowest floor, fight your way to the raised area at the back of the room, and find the skeletal body of the Aleyid warlord. Examine the body, and a ghost appears. It appears to not be Aleyid, and is quite confused. "Freedom at last! Where in Oblivion am I? Need to find some higher ground." Follow him through the room and partially up the stairs, and then talk to him when he stops. He seems to still be confused, asking: "Who are you? You weren't on the excavation team." Point out that he's not an Aleyid warlord and he says: "I... am not trying to look like an Aleyid warlord—wait. I'm Nanwen. A digger. Endarwe hired me to excavate Rulanyil's Fall, and I was digging out some rooms ... there was a cave-in." He has a realisation: "I'm dead, aren't I?" Confirm his fears, and he elaborates: "I was afraid of that. There was a cave-in, and the next thing I know, I'm on a slab with a necromancer chanting over me. She didn't seem to notice, so I laid still and hoped she'd go away. She stayed for quite a long time." Tell him that Endarwe said his remains were an Aleyid warlord's, and he says: "I don't understand. We were looking for an Aleyid warlord—to put in Endarwe's historical collection—but we never found one. Please, take me to Endarwe." Go back to the entrance of the dungeon, where Endarwe was, the same way you came through. Go into the side room near the entrance, and find Endarwe dressed in cultist robes. He is surprised by Nanwen's ghost's prescence: "By the Empyrean Light. The Worm Cult brought his spirit back, didn't they? And you led him here." Tell him you found Nanwen where the Aleyid warlord's body was supposed to be, and he says: "Of course you found Nanwen! What did you think you would find? An Aleyid warlord's body? Intact? I've looked for years and never found one! But my museum collection needed a centerpiece, and Nanwen was crushed in a cave-in. So I ... dressed him up." Ask him why he sent you to stop the necromancers, and he says: "I realized that, if the Worm Cult managed to raise Nanwen, my secret would be known. Which is why I sent you to stop them. For what good that did me. I hope I can trust you to keep your mouth shut." He rewards you with some leveled gold and Nanwen's Sword. I should check the Ayleid warlord's remains to make sure the Worm Cult necromancers haven't raised him. A ghost rose from the warlord's remains, though it does not appear to be Ayleid. I should follow it. A ghost rose from the warlord's remains, though it does not appear to be Ayleid. I should speak to it. Finishes quest Nanwen would like me to lead him to Endarwe.